Digital technology has brought about wholesale change to the processes associated with selling products over the past fifteen years. This did not happen overnight with a single invention or application. The digital revolution was, relatively speaking, quick, but it was still incremental in nature. Technology sneaks up on you. Many readers may remember the introduction of the transistor. Radios were suddenly the size of a pack of cigarettes. But the real impact was not miniaturising radios, it was miniaturising almost everything else in the world of electronics that changed the world. The entire selling process has benefited from the digital transformation of business. Within the discipline of selling, the digital transformation has been profound and positive. And, it has been beneficial to both sellers and buyers. Let’s look at some key areas. CPQ systems, with interactive interviewing capabilities, can be linked to ecommerce systems and portal technology to allow customers to learn about alternatives available, build trial configurations, and obtain informal quotations and to gain a sense of what options are available for any given solution. Selling involves a lot of different processes and we’re not going to cover all of them in this piece. However, let’s look at the four major activities familiar to almost anyone who is involved with selling. In the bad old days, sales reps frequently came on board with a valuable asset. That asset was their contact files. These may have been in the form of index cards or perhaps a rolodex file. Regardless of format, sales reps maintained their own contact files and the ownership of those files was largely accepted to be with the sales rep.
Reps were frequently hired because they had contacts within a particular market or company. Hiring the rep gave the seller access to a potential buyer that did not exist before. That was fine, but it came with one great downside; when the rep left your company, the contact files usually went with them. Technology has largely ended this practice. While contact files, in physical form, may be maintained by sales reps, the data itself is the property of the company. The development of CRM systems has delivered many benefits to both the sales rep and the selling company. But perhaps the biggest is the understanding that customer and prospect data is a corporate asset that has great value. CRM has also standardised the type of data collected about prospects and this has further extended the value of that data. The company can easily sort or manipulate contact and company data to isolate specific types of customers or conditions conducive to a potential qualification within a campaign. CRM data is normalised through regular cleansing and maintenance processes meaning it is readily useful and accurate at any time. Additionally, when new reps come on board, they have contacts and company files at their disposal immediately. When they leave the company, they may have a pocket full of business cards, but the data stays. Sales offices require informational resources related to product, solution, user stories and other relevant materials to help educate customers and prospects. These tools help prospects understand how a given product can be of benefit to them, how other companies might be gaining advantages using the product and to assure them that the selling company is a valid and reputable enterprise. For many years this meant warehousing large amounts of product data sheets, brochures, user profiles and whitepapers. This was a major expense to a small sales office and it also frequently took up a large amount of physical space, especially when the company offered a large or diverse product line. When products were updated, or when new models appeared, all of the out of date collateral had to be destroyed and replaced with more current information. Today, this process is vastly improved with interactive web sites, prospecting or customer resource portals and other online facilities. Since all of this formerly printed material is now digitised, a much wider variety of content, covering many more focused applications and markets can be practically maintained. Prospects can also directly access the right information for their own edification. The rep doesn’t have to dig around in closets or on shelves in the sales office looking for some obscure piece of collateral. The customer finds it themselves online. The entire process can be cloud-based and instantly accessible from multiple sales offices. The content is always up to date and current for both sales rep and customer. Not so long ago, engaging and prospecting meant picking up the phone and blind calling into accounts and target companies in an effort to uncover possible opportunities. No one really liked this aspect of sales. Cold calling put fear into the hearts of many sales reps and prospects hate the intrusion of blind sales phone calls during their busy work days. This type of outbound selling process was inefficient, unpleasant and is now unnecessary. The online or web-based, customer portal offers access to all the materials available for any given product or solution. Prospects have shown a preference for doing much of the early cycle education and evaluation of alternatives on their own, rather than calling upon a sales rep to lead them through an array of educational materials. 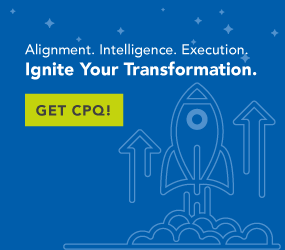 CPQ systems, with interactive interviewing capabilities, can be linked to e-commerce systems and portal technology to allow customers to learn about alternatives available, build trial configurations, and obtain informal quotations and to gain a sense of what options are available for any given solution. Marketing and sales can monitor online behaviours of visiting prospects. All visitor data is typically reported and stored within a CRM company or contact file. Sales can then determine how far along the prospect is in a buying cycle. At the appropriate time, personal contact can be established via additional follow up offers or courtesy calls. At that time the contact can be engaged and qualified as a potential buyer. The entire process is online, cloud-based and instantly updatable with current versions of data. It literally feeds leads to the sales rep that are mid stage, warm and legitimately interested in purchasing a product. The bittersweet reality of selling large accounts in the past was the fact that in order to get to a YES, you had to create a dog and pony show in the form of a proposal and presentation. These projects frequently came to light on Friday afternoons or during the day before some holiday weekend. This meant that you would be writing up ROIs, survey reports and all manner of proof examples related to why the customer should sign with you while everyone else was grilling steaks, swilling eggnog or watching football games. Manually prepared proposals might be foisted off on office staff or junior sales reps, but then the likelihood of errors or omissions increased greatly. CPQ solutions provide the ability to automate this process. Sales reps can generate simple quotations, dated and itemised, and also full-blown proposals. Proposals complete with consistent content, messaging and correct visual marketing standards intact. This ability assures the sales rep that they can respond quickly and accurately, without trashing an entire week end and at the same time assuring that the proposal content is correct, accurate and consistent with the marketing guidelines and messaging promulgated by the enterprise. If your sales team is still hoarding rolodex files, lugging around cases of datasheets, spending hours dialling into voice mail boxes and ruining weekends putting together proposals that are an embarrassment, you really need to look into what’s been going on for the last fifteen years or so. Cloud-based CRM, CPQ, ecommerce and online presence technology are ready to go for you. The technology is available, right now, to transform your sales operation. Digitally empowered selling organisations are engaging with more prospects, with higher qualification ratings and who are closer to a buy decision than any shoe leather leads system ever produced.